This morning at 6.30 all kinds of alarms went of in my dorm of the Bompa�s Hotel in Beachport. The watches and phone alarms ended up useless, we all stayed in bed until 7am, the time breakfast would be ready in the downstairs dining room. A quick look outside showed me that it was going to be another day with lots of rain, clouds and sunshine. I am almost feeling at home. During breakfast I started a discussion with the men about who was snoring last night. Without calling names I pointed out it could have been American Louis, because he was sleeping in that corner of the room. He acted insulted (and acted that also very good) but indeed wasn�t sure if it was himself or not. �Guess who�s going to wake up with corn flakes in his bed tomorrow,� he grinned at me, without calling my name but pointing out it could be me. From Beachport, which is almost an island if it wasn�t connected to the mainland by a strip of sand and the road on it, we drove around the Rivoly Bay and had a nice look at far-away Beachport from the other side and the limestone piles that are slowly washed away by the splashing ocean waves. 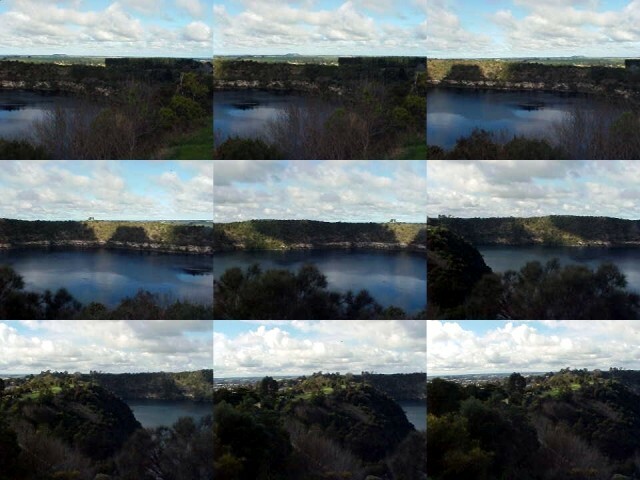 We drove on and ended up in Mount Gambier for the afternoon. 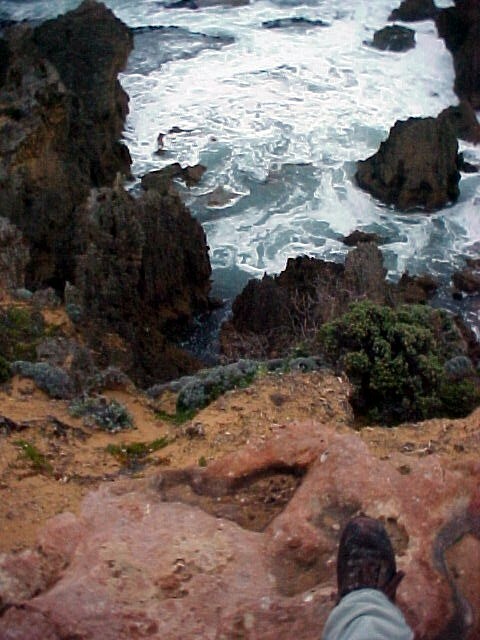 Mount Gambier is the second largest city of the state South Australia with just 30,000 people. Imagine that the all the other towns can only be smaller! Mt. Gambier is built on the slopes of an extinct volcano with three craters, the main one containing The Blue Lake that mysteriously turns blue during summer months. Today it was naturally green-blue when I looked down from the lookout. 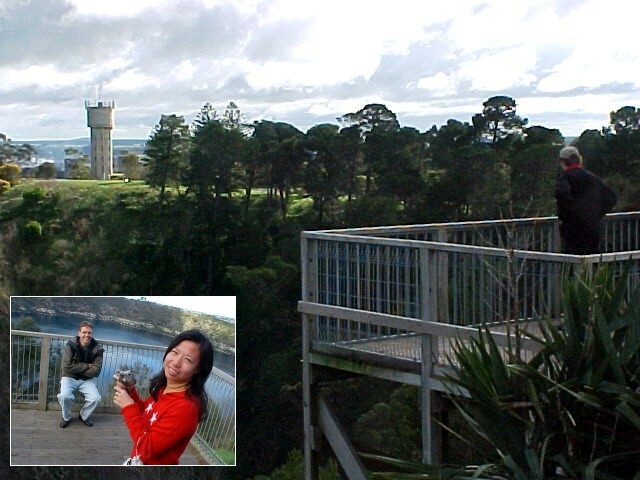 Another attraction in Mt Gambier is the Umpherston Sinkhole. This is a big and unexpected crater in a green and family friendly park. Just right there! 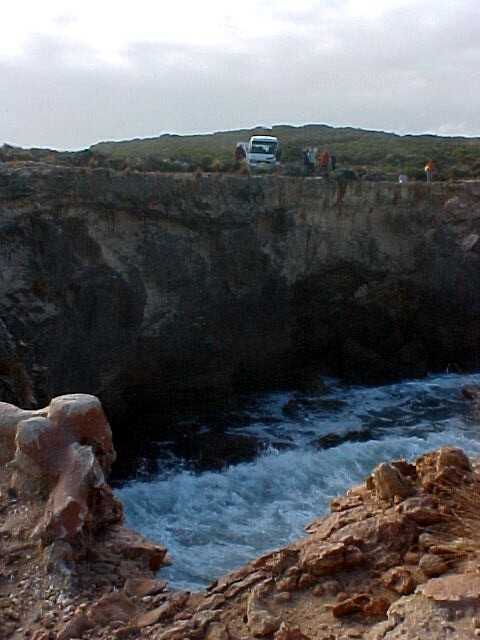 A sinkhole is created when water sinks through the limestone soil and flows through the limestone soil and flows through millions of small underground canals to some exit point like an ocean or river. Such an underground channel could grow very big, like with rock pools. When the roof collapses, a big hole reveals itself to the human world. The sinkhole was named after one of the first farmers who owned this piece of land: Mr. Umpherston. He made the sinkhole a little attraction in the 1850�s and at that time there was so much water in the hole and that he needed a boat to enable a retreat to a small island. In that sinkhole! Mr. Umpherston died and while the water slowly disappeared the new owners neglected the place terrible. 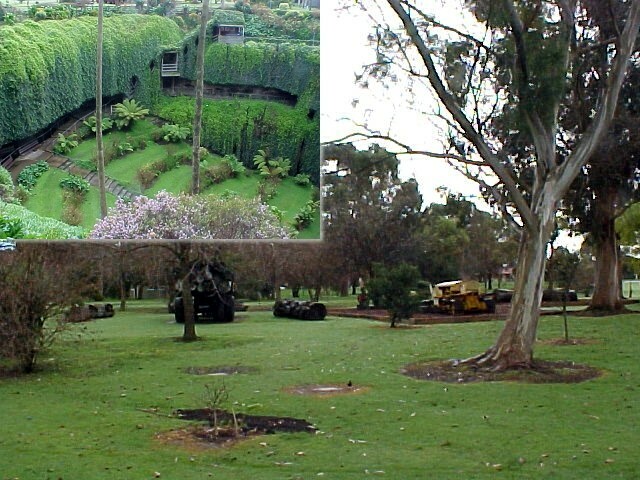 It was only in the 1980�s when volunteers of the Wood Department cleaned the rubbish out of the hole and made it into the naturally and green garden it is nowadays. Just walking around there, thinking about what happened here in the last few centuries is already amazing. 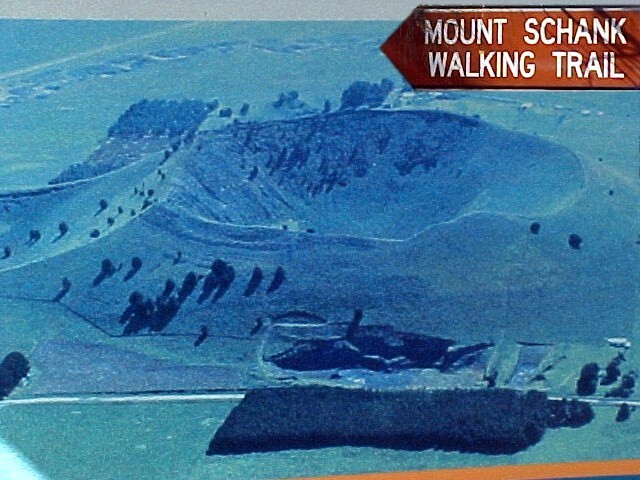 From the Mt Gambier sinkhole we left Mt Gambier again towards one other extinct volcano: Mount Shank. This remote mountain rises up to a little 158 metres. The fair (!) walk to the top rim provided me a spectacular 360 degrees view on the grassy crater down below and the surrounding farmland. Everybody of the group just stood around on that rim and waited for lunch to be ready for us below at the picnic spot. For my back problem�s sake I decided to go for a firm walk and meandered around the entire volcano! It was quite exhausting, especially if you visualise a two feet wide path and not much on both sides. It was a great experience! The sun was shining bright and I just walked on and on until I ended up where I started. It might had taken a little 30mins of time, but it sure felt like a 3-hours-walk. Down below the volcano tour guide Bruce and his assistant David had prepared a picnic table with all the ingredients for some Aussie sandwiches. All the others were already eating lunch, but I first had to catch my breath and wait until my legs stopped shaking and my vision got back from blurry to sharp. From Mt Shank we drove on along the south coast along Larry the Lobster in Kingston, passing towns as Port MacDonnell and the fishing township Nelson ending up at the Cape Bridgewater Bay. 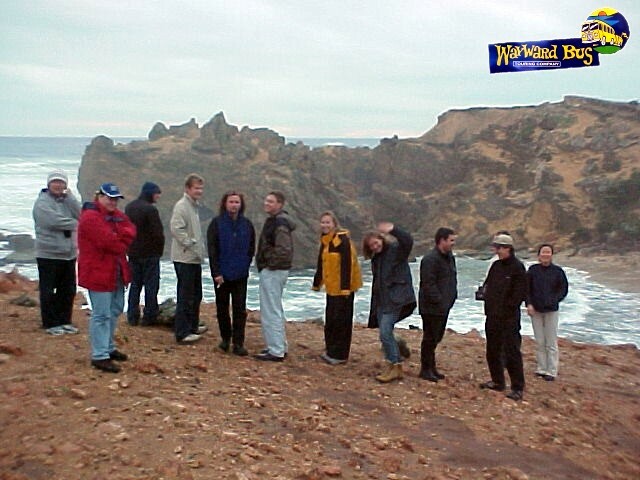 This bay is a huge body of water between the high cliffs of Cape Nelson and Cape Bridgewater and offered a wide and gently arcing sandy beach where we had a coffee break. It was here where the English guy Al, Canadian Caryn�s boyfriend, jumped into the cold winter water for a swim. Crazy! Nevertheless I tried to get Caryn into the water too, being very careful (only because of her camera in her hand) and as a �thank you� she covered me with sand! Ridiculous, ain�t it? Kids play. Hehe. 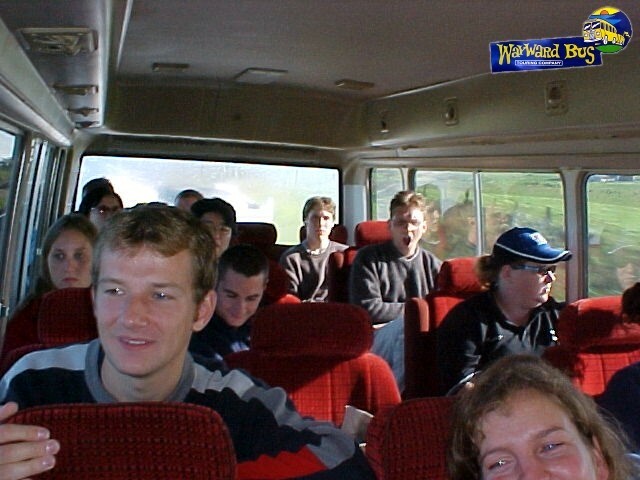 But we weren�t at our point of destination for today yet. We first had to cross the state border (photographs!) and change our clocks to 30 mins ahead. 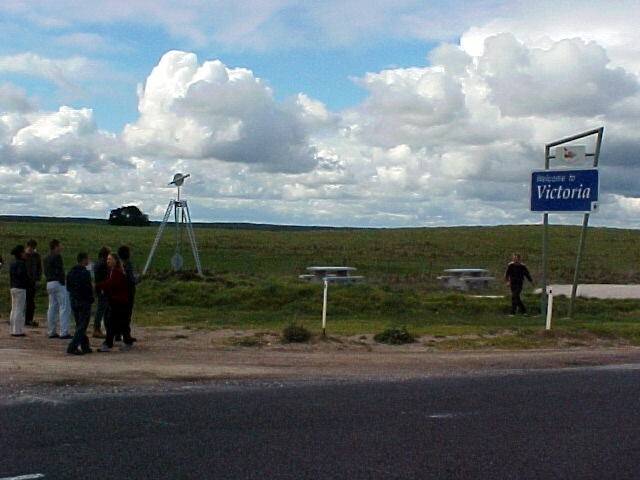 With entering the State Victoria I had now passed my 6th state border. Good bye South Australia! 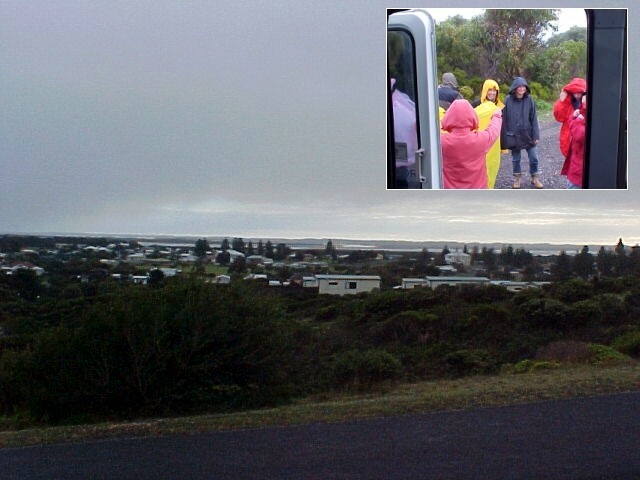 It was only another drive from Portland to arrive at our stop for the night: Port Fairy. In 1843 a Sydney solicitor James Atkinson purchased 5120 acres (2072 hectares) of land at Port Fairy for �1 per acre. He converted the sealing community into a modern port by draining the swamps around the town, subdividing and selling/leasing the land and building the harbour on the Moyne River. So proud was Atkinson of his handiwork that he decided to rename the town Belfast, after the Irish city which he called home. A similar project was undertaken by William Rutledge who had also received 5120 acres in 1843. The result was that Belfast became the largest privately-owned town in Australia and the few local residents, who had simply squatted prior to Atkinson's purchase, suddenly found themselves paying rent to their new landlord. 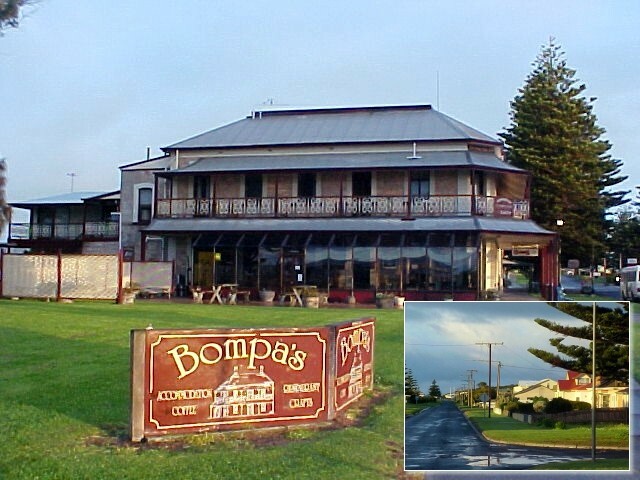 It wasn't until 1887 that the town was renamed Port Fairy, this was as a result of a special act of parliament. Port Fairy is one of those delightful towns where I felt as though if I stayed another day I would suddenly find a whole extra world of things to see and do, but where I might be bored on the third day. When we arrived in the evening darkness the things I noticed of Port Fairy were the wide streets, white-washed grand public buildings Victorian styled pubs. 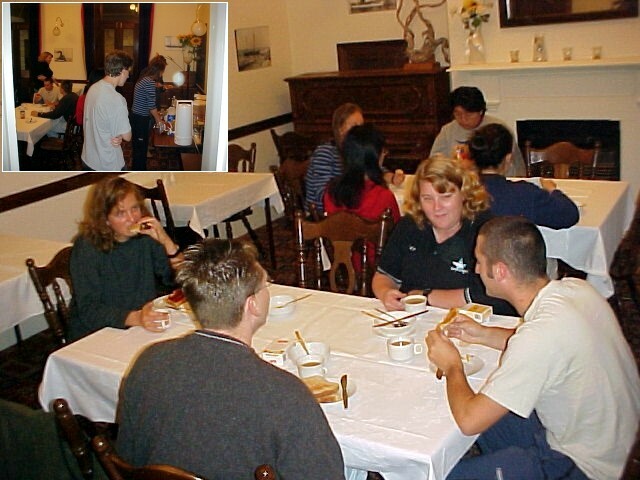 We all stayed at the pre-booked Port Fairy YHA Hostel, an old but unpretentious building a few streets away from the main streets. I was hungry and on the bus Bruce had already told us where we could have dinner in town. He recommended a few pubs and restaurant and it ended up that almost everyone went its separate direction. I decided to head to the pub and I walked along one of the town�s main streets, ending up at the historical Star of the West pub. I looked through the window and decided NOT to go for that special menu of soup, meal and a bear for only ten bucks. I decided not even to enter that pub. Just because I had a bit too much of those fully bright-lit country pubs, with several TV-screens with blinking fluorescent gamble scores and a another TV that always seems to show a channel with what you don�t want to see anyway. If you wouldn�t count the three rowdy locals at the bar, the place would be totally deserted. There was no other sound than some noise from the TV and people talking. I did not even wanted to wait for a meal here. Sorry folks. I got today�s dinner at the Chinese restaurant around the corner from that pub, for 13 dollar I had a sweet and sour pork meal and a bottle of Coke to take-away to the hostel. I am actually really enjoying this tour, I had to write that down. Also because nobody on board of the bus knows my background or because I am in no way treated differently than anybody else. The others meet the normal outgoing Ramon. I am not in any personal spotlight these days and if I want attention from somebody I won�t be already there automatically, but I actually have to do something for it. Maybe this is the �retreat� that I needed for a long time. I am not the celebrity that I am called out to be and I like it that way.